Rebels ran the five boroughs. Race day was November 1, 2009. Read Andrea's account and see photos of an interesting tour of NYC. Staten Island, Brooklyn, Queens, the Bronx and finally Manhattan, with the big finish in Central Park. Dorothy ran with her and Tex had an impressive race. 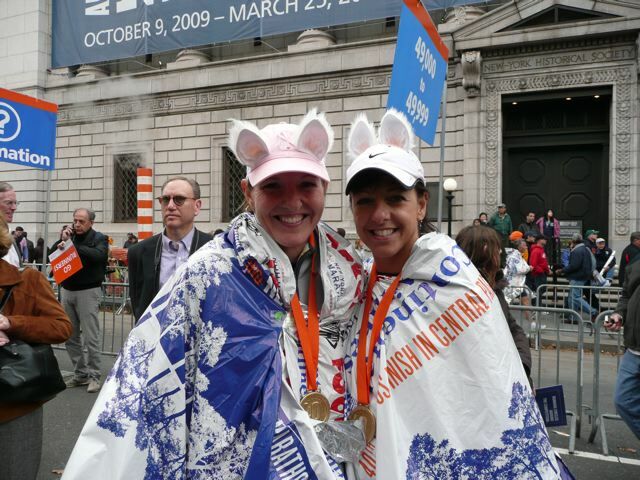 Last spring Dorothy and I set out to train and run NYC together � no matter what! 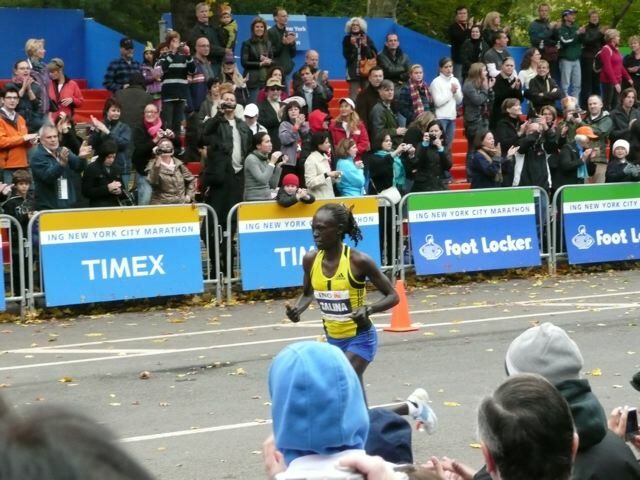 We had both done other marathons; including two Boston�s each, but never at the same time. 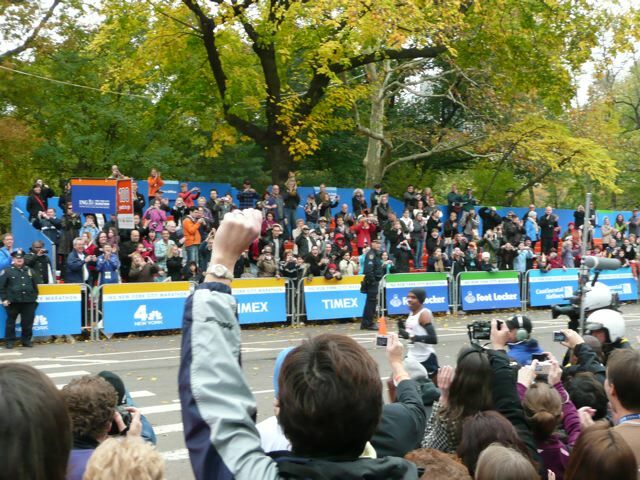 2009 and the 40th running of the NYC marathon was it! Winning a silent auction to get in with Team ING was so fortunate. Not only did we get some VIP treatment-our friends did as well. Kelly, Chuck, Suzanne, and Lisa got free admission to a $250- worth gourmet buffet and open bar with special seating in the finish line bleachers! Yep-They were living large while we were trudging through 26.2. Several experienced NYCM runners gave us tips on how to handle the 3 hour, cold, windy wait on Staten Island. We were equipped with garbage bags to line the wet grass, blankets, and many layers of sweats. We could leave all this behind to be collected for the local shelters. What came as a very nice surprise was our Team ING tent! Heated, on asphalt, free coffee, snacks and our own port-o-potties and gear check truck. Sweet! We relaxed on our blankets comfortably and made friends with the runners sharing the space around us. There was excitement all around. Apparently we enjoyed ourselves so much that we missed hearing the announcement to line up for our wave! There are 3 waves, and three color coded starting lines in each of these waves, with corrals within them-based on predicted finishing times. There was a good 20 minute walk to our blue corral area, which was not well marked. 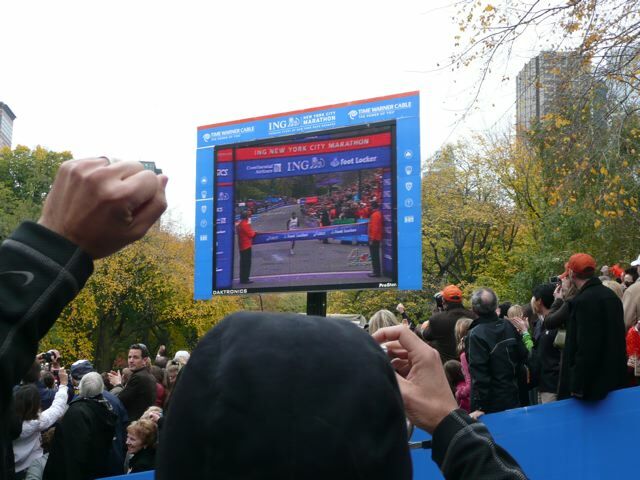 The NYRR volunteers were great and much appreciated�with the exception of this area. We were sent in wrong directions each time we asked. And by the time we got there, the fences were gated off and wave 3 was lining up! I was in a panic and kept repeating �I am NOT starting in another half hour!� Frantically, we elbowed through the masses where we saw an opening and begged the guard to let us into OUR wave. Apparently some volunteers were encouraging people to jump the fence, and other volunteers were calling security to curtail the situation. It took five minutes and tearful convincing until they lifted the rope for us and we started walking with the folks at the end of the wave. I had a feeling that may be a problem for running at our goal pace-the further back the slower the pace. But at least we were in the right wave. Finally, at 10 am, with thousands of athletes singing along to New York New York blaring on the loud speakers, we were off on our much anticipated journey! This course is hillier than one would think. There were 5 bridges to cross- the biggest in the first mile over the Verrazano Narrows Bridge. This was an awesome view and where I knew it was going to be a race like no other. Runners are talking in every language and I sensed an overwhelming common bond shared with people from all over the world. After enjoying the downhill of that bridge, we crossed into the Brooklyn neighborhoods -- welcoming, excited and full of energy. I loved the different ethnic food and laundromat smells and the cheerful encouraging faces, high fives with the children, and screaming. 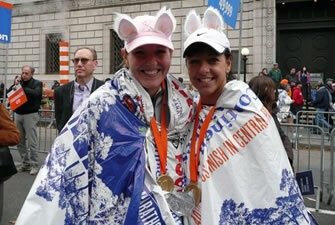 This was also the first area of several times we heard �Go Bunnies!� from the crowd. No, they were white cat ears Dorothy and I had on our running caps. I guess they looked like bunny ears and they didn�t see our long white tails pinned to our shorts. Our names printed on our tops was another plus so the fans could call us by name to cheer us along. Here�s where things went south. Why neighborhood folk think it�s perfectly fine to walk across the street with shopping carts through a crowd of runners is unbelievable! This caused a chain reaction of the runner to my left tripping, knocking me into Dorothy, who bore the brunt of it and almost face planted onto the street. Great recovery�it was like watching something in slow motion. But she pulled her hamstring badly and we got off the course for a few minutes while the poor thing caught her composure. 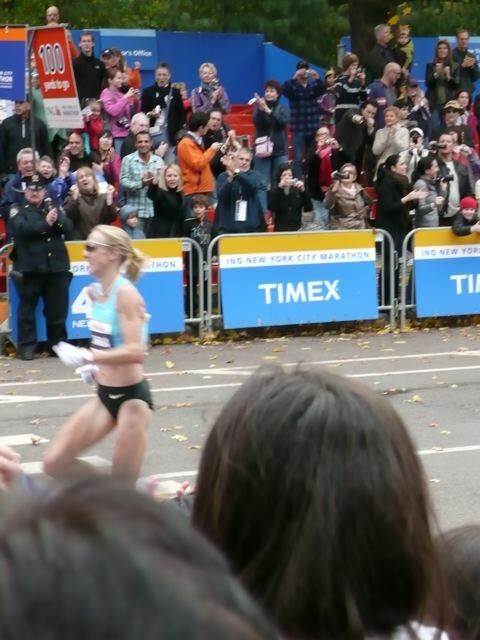 When I told this story to a coworker who has run this race several times, he knew exactly where it happened - in Hassidic Williamsburg- notorious for the residents to go about their business and pretend there are not 43,000 athletes running through the streets. Then somewhere in the Bronx, we were passing a water cup between us and a big guy came barreling through between us, stepped on my shoe, which came right off! I had to stop to bend over to put it back, which caused others to bump into me and almost mow me down. I yanked my shoulder in the process. Sheesh! Pushed and shoved and knocked around�it was New York after all. My favorite areas were 1st Avenue where the street was quite wide with huge roaring form the sidelines. Entering the park was awesome too. It was so pretty with the foliage. The cheering seemed more personal there too because it was near the end, the runners needed more encouragement and the fans did exactly that. The experience was significant and unforgettable, but I have to say my enjoyment was hampered by some things. It was very difficult to hang onto a good pace while jockeying around people and slowing considerably through the congestion especially at the numerous water stops. A bit too crowded for my liking. Even with knowing that this race was �just for fun,� it took a good hour for me to come to terms that this really will be a slower race. I�m too hard on myself. Mile 24 on, I kept smiling and saying that we rock. I thought of the stinking hot summer long runs, the 4:30 am weekday wake-ups, the sacrifices, the leaving my girls with friends for a few hours on a weekend, the forgoing of fun late nights out. We dodged the H1N1 bullet. I fortunately recovered from a late in training foot injury. 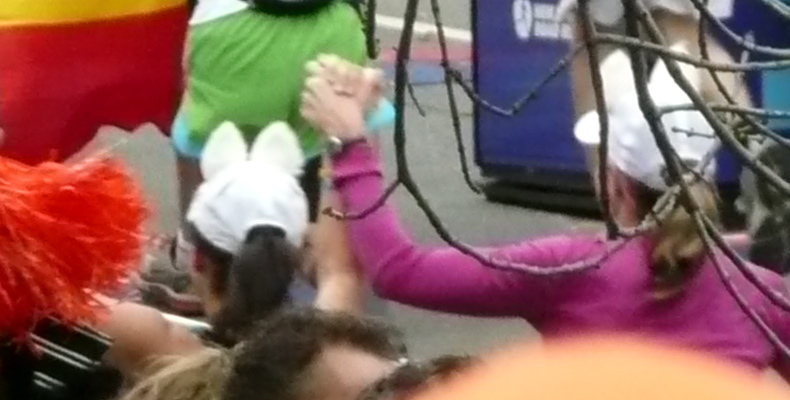 We finished in 4:04:22. Quite slower than each of our best times. Yet� 16,570-th out of 43,475 finishers. Quite an accomplishment especially with what was endured. 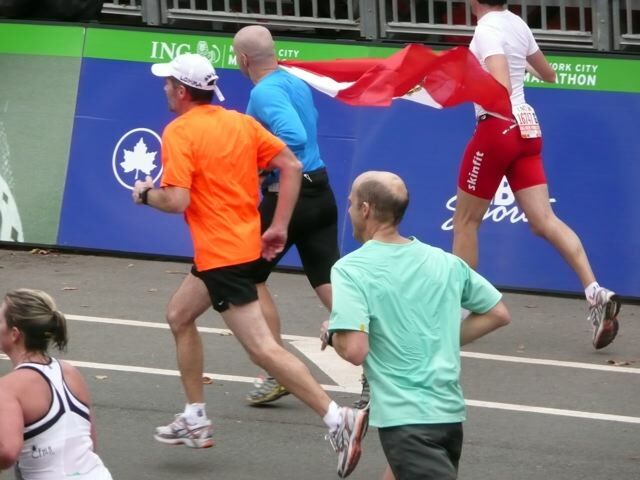 Meanwhile, Tex finished in an impressive 2:51:03 (32nd out of 689 males 20-24)! 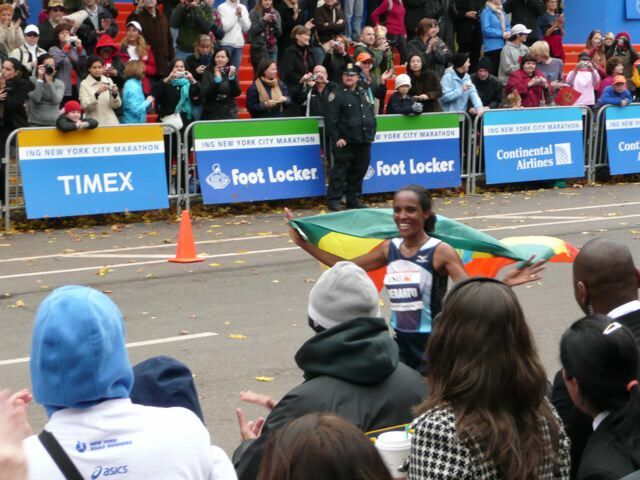 Meb wins - first USA winner since 1982!